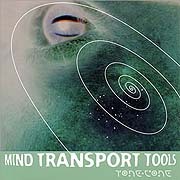 Tone-Cone (65'39") by Mind Transport Tools (a.k.a. Cameron Akhunaton) harkens back to the early days of electronic spacemusic, a time before the inclusion of rhythm. While steeped in the sensibilities and style of the 1970s, this music points forward, but with a slant on the many intricacies of texture and the genre's overall form. The virtue of this music is that each ambient work is built on such a basic and open design that any interpreter must first arrive at deeply personal conclusions about the music well prior to its realization. Tone-Cone evokes the spaciousness of the universe as well as a contemplative quietude and depth. As listeners we turn over our trust to the composer. In this mode of expression, one cannot predict where each piece will lead. Like early works of electronic music, Tone-Cone has as its essential feature a dramatic form portrayed through soft dynamics over long stretches of music. The detuned drone of oscillators, the slow sweep of a resonant filter - in this context even the most basic synth tones seem fascinating. It is the music's subtlety and texture that most notably characterize it. Sometimes dramatic, elsewhere spare and exploratory, the darkness of this album's tonality depicts an inward poetry, the effect of mystery and distance in a whisper of infinity.